Keyword – A search term, something typed into a search engine to find what you’re looking for. People use the internet in one of two ways: to create content or to browse/consume content. “Browsers” use the internet for leisurely activities like shopping, reading, games, fun, and social media. The people who use the internet to reach an audience — bloggers, businesses, artists, graphic designers — are considered creators. Keywords are important for both parties, since keywords bring browsers to creators and vice versa. Throughout the next couple paragraphs, we will explore practical applications and a few ways to effectively use keywords. Did you enjoy the solar eclipse? Millions of people across the United States used special glasses to view the natural phenomenon. How could a retailer have taken advantage of keyword research to increase its sales of these glasses? A good way to reach people is to find out what they are searching for already. Google Trends is a free program that compares search terms from Google users. 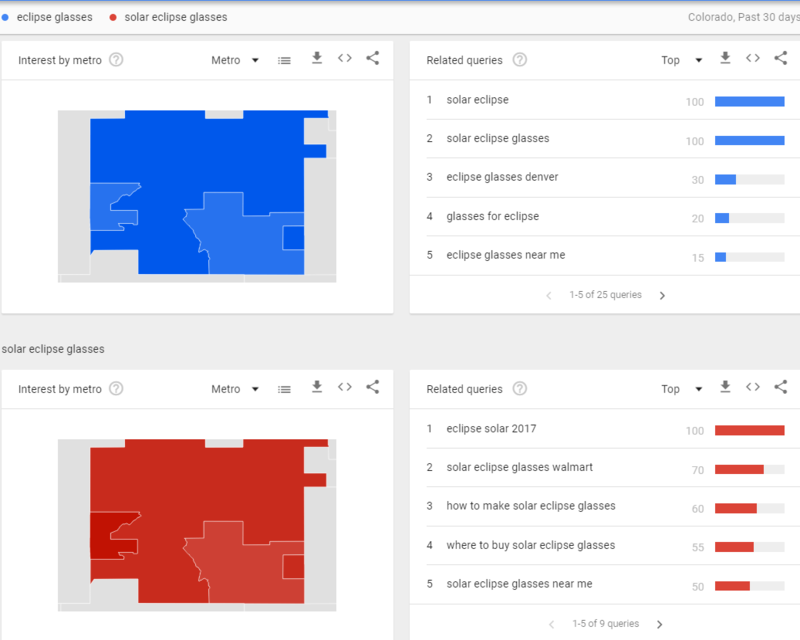 Trends was used in the example below; the two keyword phrases we compared are “eclipse glasses” and “solar eclipse glasses”. 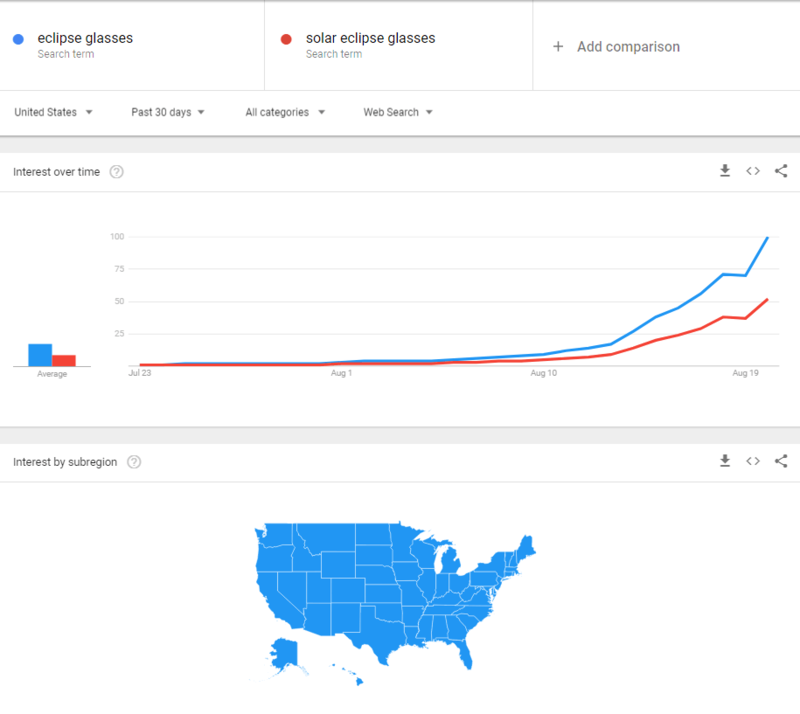 Over the last 90 days, more people Googled “solar eclipse glasses” than “eclipse glasses” across the United States. To further segment the market, we filtered out results outside of Colorado. This will localize our campaign and allow for greater targeting. 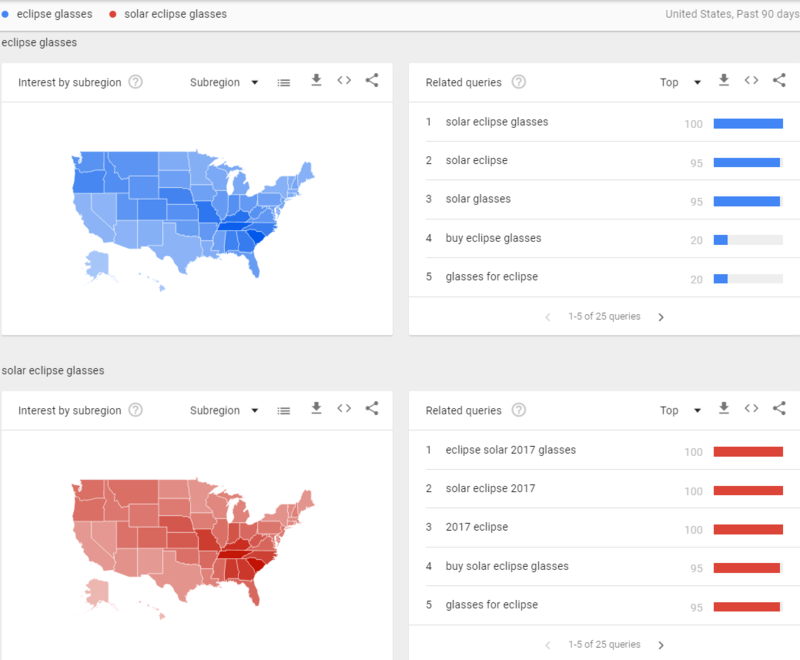 Colorado is slightly divided in their search term preferences: the Denver metro area is more likely to search “eclipse glasses”, while Grand Junction and Colorado Springs favor “solar eclipse glasses”. These may seem like small nuggets of information but every bit counts. The phrase “solar eclipse glasses” would fare better in a nationwide campaign. We would use that phrase in ads, web pages, blog posts, and social media. If we wanted to get more specific, we would use geotargeting tactics and contextual local SEO. In Colorado, we would sell the same product but change up the language: Colorado Springs would have “solar eclipse glasses” in its advertisements but people in Denver would read “eclipse glasses”. Let’s end the solar eclipse example. Instead, we will focus on our brand (Hashtagitude). Keywords increase visibility for creators, which is why we designated a specific keyword for this blog post. Each time the word “keyword” is used, our PageRank is affected. A couple other factors come into play with page rank but that’s for another blog. Content creators should have a keyword on EVERY page of their website. All of these factors intertwine with one another to form a complex web online; that complex web determines how successful your marketing strategy will be in implementation.